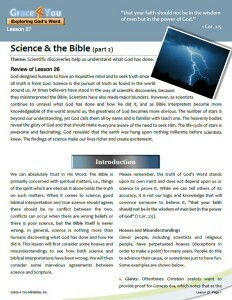 Lesson 27: Science & The Bible (Part 2) | Grace 4 You Ministries, Inc.
Grace 4 You Ministries, Inc.
We can absolutely trust in His Word. The Bible is primarily concerned with spiritual matters, i.e., things of the spirit which are eternal. It alone holds the truth on such matters. When it comes to science, good biblical interpretation and true science should agree; there should be no conflict between the two. Conflicts can occur when there are wrong beliefs or there is poor science, but the Bible itself is never wrong. In general, science is nothing more than humans discovering what God has done and how He did it. 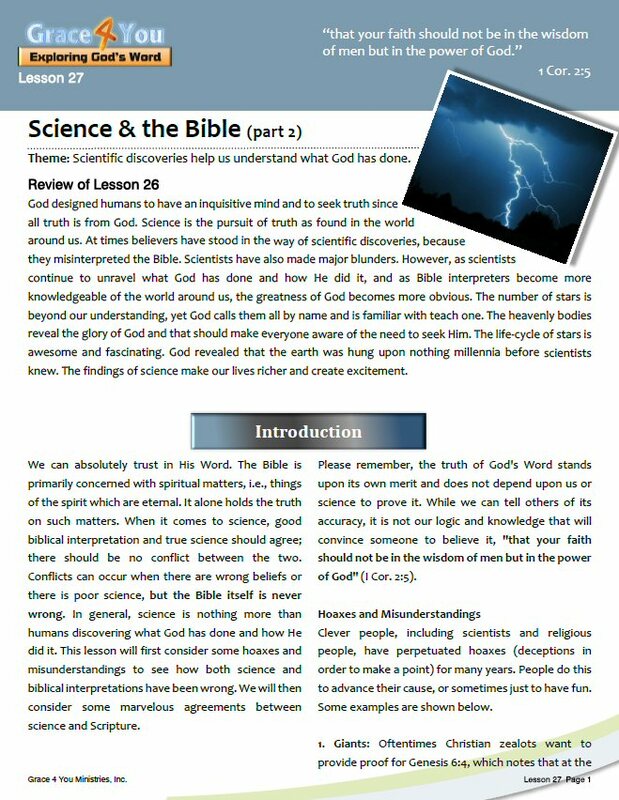 This lesson will first consider some hoaxes and misunderstandings to see how both science and biblical interpretations have been wrong. We will then consider some marvelous agreements between science and Scripture. We add new lessons on a regular basis. Subscribe now to be the first to know when new lessons are available. If you would like to support the development of additional materials, you may send donations to our mailing address or use the link below. Grace 4 You is affiliated with the Grace Gospel Fellowship (GGF). Visit the GGF website to find other ministries including literature, churches, missions and Grace Christian University. Copyright © 2012 Grace 4 You Ministries, Inc.